Jacob's Well, in the basement of the Bir Ya'qub monastery in Nablus. Earlier this week, I received an email from the Israel Bible Center. On it, there was a drawing depicting Jesus sitting by Jacob's Well in Sychar speaking with the Samaritan woman. I enjoy looking at drawings like this. Because cameras were not invented until only recently, any ideas that we may have about what the site looked like is based on historical records and our own imagination. How one person may read the record and depict it in the own mind may be different than the way that someone else depicts it. Knowing that, I have little confidence in any single drawing. But in each one, there is probably an element of reality. Visiting the site today takes even more of an imagination. The well currently sits in the basement of a Eastern Orthodox Monestary in the modern city of Nablus. Entering the church building and going downstairs almost forces one to completely forget that for thousands of years, this well was outside and accessible to anyone walking by. Of course, that also included Jesus. 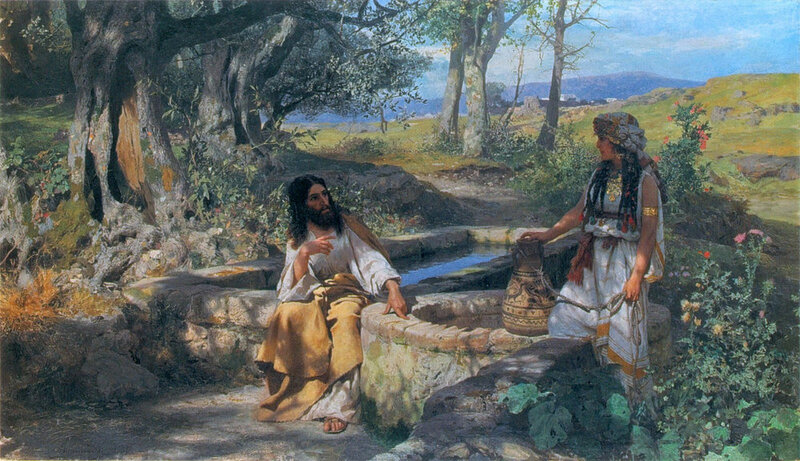 Drawing from the Israel Bible Center depicting Jesus speaking to the Samaritan woman at Jacob's Well.